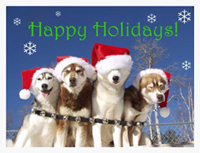 For daytime tours at Husky Works Kennel we ask that you make reservations by e-mail or give us a call at 802-896-3478. Please allow 2 hrs. for your experience, includes intro. 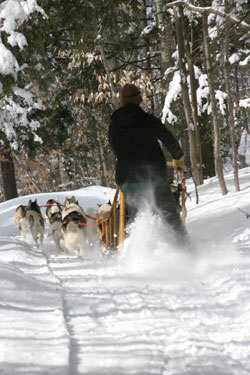 to dog sledding and time in sled. Reservations are a must if you are looking to take a guided tour. We do not accept walk-ins and often times it is necessary to make your reservations early in the season if you are looking for specific dates. Reservations require a 50% deposit due at the time of booking a date. The 50% deposit is refundable up to 15 days prior to your ride, less $50 which you may apply towards another ride if taken within the same season. No shows will be charged the full sled pricing. If Husky Works Mushing Co. needs to cancel your ride due to trail conditions or any other reason your deposit will be refunded in full. Methods of payment at this time are: Cash, Visa or Master card, or traveler's checks.